Kerama Islands have a subtropical climate with an average air temperature of 29.7℃ and a water temperature of 27.7℃ from June to August. All of the Kerama Islands develop fringing reefs. The water surrounding, supplied from the Kuroshio Current, is pristine. Healthy coral reefs, with a rich faunal diversity, make this area a treasure trove for marine scientists and resort divers. The occurrence of some 250 species of reef-building corals (62% of all the coral species in Japan) has been reported in this area. In the coral reefs, 360 species of fishes and 1400 species of marine invertebrates have been recorded. 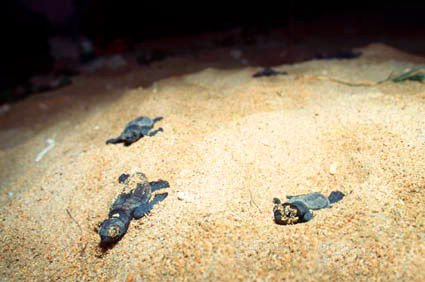 Sea turtles sometimes come ashore for egg laying during the summer season. Also, many butterflies and other terrestrial creatures can be found on the island. Further, the Kerama deer, living only in this area, has been designated as a national protected species of Japan.